Made to suit your own specifications, add logo’s names and rider numbers in the NINETWO customiser on next page. 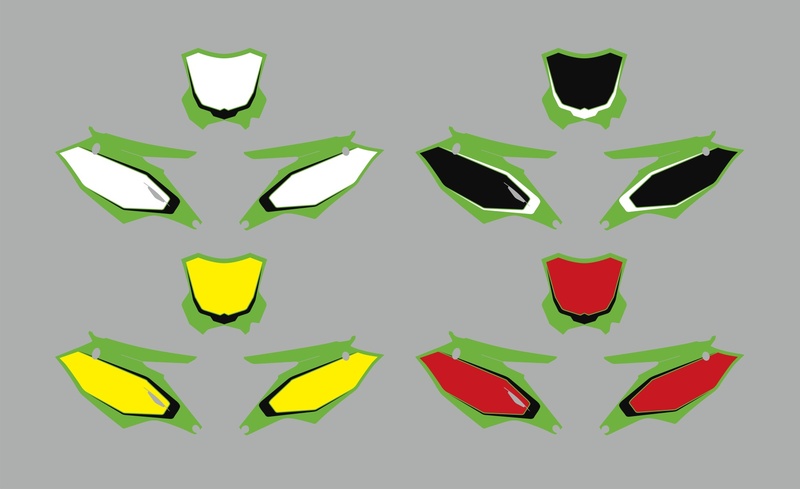 DESIGN EDITOR – We are proud to present the NINETWO customiser, allowing you to customise and change your own kit. Using logos and fonts supplied or even adding your own logos, this will help get the finished product to you faster then ever. If you are not wanting to use the customiser, JUST LEAVE US A NOTE OF CHANGES TO MAKE in the comments box before checkout. Add your name and number font selection next to your name and number in the fields supplied by selecting from our pre determined fonts from images supplied. All fields below are mandatory, please also see bottom of page for more info before proceeding to design editor. 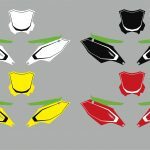 Does your bike have different colour plastics to o.e.m? Want a bunch of mini plates to slap around. Done to match your front plate design. Left your order to last minute and need your kit in a hurry. For an extra fee we can get you sorted as quick as possible ready to hit the track. This also skips the proof option, so make sure you double check everything. Please call or email to double check if this option is possible. Do your require a proof of design before printing? Turn around time is sometimes 1-2 weeks on all customised NUMBER kits with proofing. To help speed up the process simply select NO THANKS in the proof selection and we can proceed with your order straight away. Made to suit your own specifications, add logo’s, names and rider numbers in the NINETWO customiser on next page or purchase as shown. DESIGN PROOF – turn around time is sometimes 1-2 weeks on all customised NUMBER kits with proofing. GRAPHICS MATERIAL – We now offer 2 types of materials, our original product as we have used from day one is now know as PREMIUM, this product is a little more heavy duty then the laminate but also comes with the price tag and around a 2 week turn around time. LOGO UPLOAD – If you are using the NINETWO customise feature and load your logo in to use, please also send us directly the usable format, preferably EPS. or PDF as we like to print off the highest quality print we can. if you can’t load your logo in please use the font feature and write in where you would like you logo added, then email it to us. EXPRESS SERVICE – Need your kit on a quick turn around, JUMP THE QUE for an extra fee and we will have your kit done within 7 days. selecting this only applies to no proof and over laminate products. 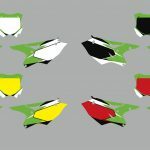 Nine Two Decals has specialised in customised MX decals for over nine years. We are always looking for ways to keep our products the highest quality on the market with a unique but clean style. 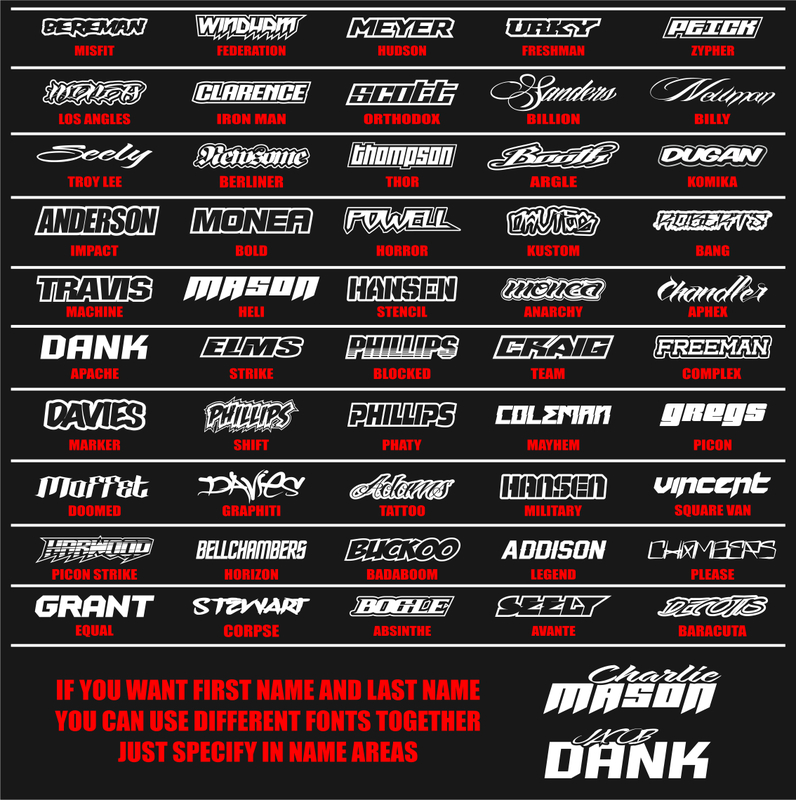 We have one of the finest selections of custom motocross decals available on the market!